Our motto is “Give Your Pet More”. We stand behind this motto wholeheartedly and strive to provide the best quality of treats, care and companionship for your canine friend. TO LEARN HOW OUR DELIGHT BITES™ ARE PROCESSED, PACKAGED, VIEW STATISTICAL & NUTRITIONAL INFORMATION, SEE BELOW! All our beef has been raised in their natural environment on upstate NY local farms. These farms take pride in their agriculture, are dedicated to producing healthy, wholesome Choice Black Angus beef using low stress handling and given no growth hormones or antibiotics. The farms are committed to raising cattle who graze on nutrient and mineral-rich pastures in the northeast. All our chicken has been raised in their natural environment on upstate NY local farms. These farms take pride in their agriculture, are dedicated to producing healthy, wholesome chickens using low stress handling and given no growth hormones or antibiotics. The farms are committed to raising chickens who graze on nutrient and mineral-rich pastures in the northeast. All our venison is sourced from New Zealand called Cervena® venison, the best tasting venison in the world. It is distinguished from all other venison by the trademarked assurance that the meat has been naturally produced and processed in accredited plants with high quality standards. To qualify as Cervena® natural tender venison, the farmed animals must meet specific criteria. The meat is brought to Hunts Point Meat Market in the Bronx, NY for distribution. 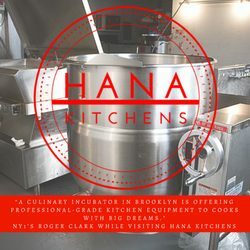 We get our Choice Black Angus Beef, Chicken and Cervena® Venison from Master Purveyors, Inc., a local vendor at the Hunts Point Meat Market who is known for selling their top of the line meat to 5 star and 4 star steakhouses around NYC. Delight Bites™, by Delight Bites, LLC holds our suppliers to strict standards and stand behind every product we make, not only with the guarantee of the most wholesome ingredients but quality control assured! Our butchers send us pre-packaged meat, packed safely to avoid cross contamination and spoiling. 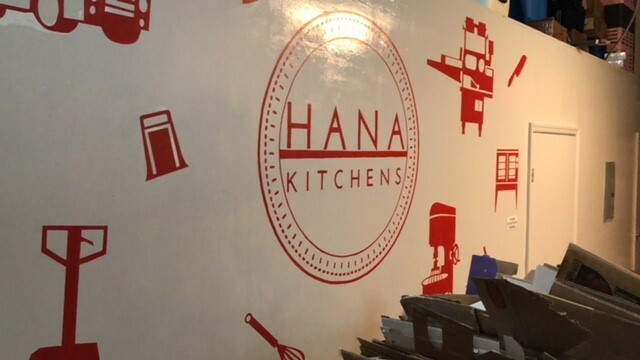 Our production consists of slicing the beef at our commercial kitchen in industry city, Brooklyn, NY - Hana kitchens - and dehydrating it at 160° for 5 hours meeting all FDA safety standards. 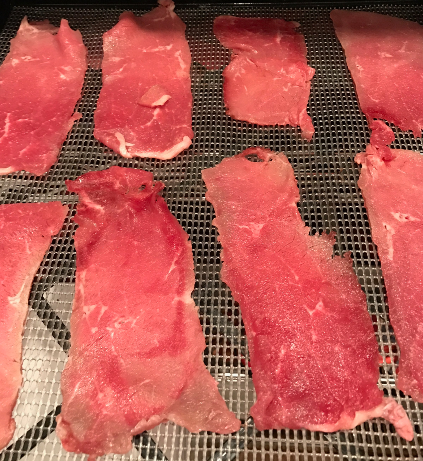 We utilize excalibur dehydrators that use patented hyperwave technology and horizontal drying which removes water from the meat. 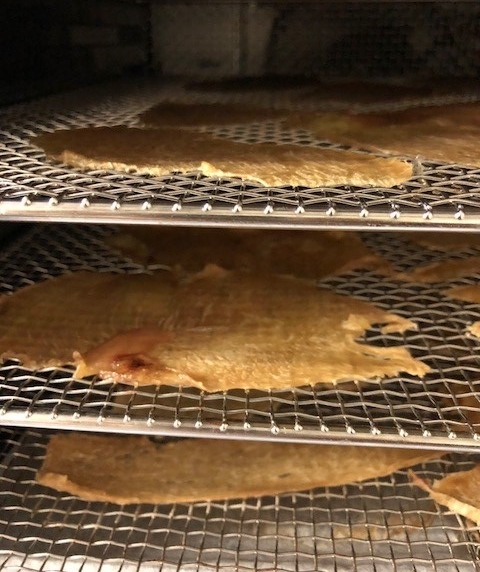 We taste test every cut before packaging and furthermore; we package our product to the top of the bag with a clear side so you can see the quality of our treats for yourself. We want our customers to know exactly what they are getting. Cervena® is "The Champagne of Venison"
We stand behind every product we make, not only with the guarantee of the most wholesome ingredients - Quality control assured!! * All samples are picked at random from bags submitted to NJFl, Inc., we take the average of all sample results. WE LET OUR MEAT DO THE TALKING! DELIGHT BITES™ ARE MADE & PACKAGED WITH LOVE & CARE TO GIVE YOUR PET MORE!! ORDER YOUR DELIGHT BITES TODAY! Fully approved and licensed with the city/county/state/FDA, and in some special cases the USDA.